Long time, eh. Anyway, a dainty little post for y’all techies. Okay, so I’ve been meaning a to buy a Hard disk drive (HDD), and I was researching a bit the other day and came across SSDs (that’s Solid-state drives, for the uninitiated), which apparently are the in-version of HDDs. And I’ll be honest, I had no idea what an SSD was! Did I ever mention that I’m a Computer Science graduate, by the way? Anyway, I digress. Aren’t getting any of this? Let me back up a little. So, HDDs are data storage units. They are generally the size of a notebook and are used to store data when your CPU no longer can. 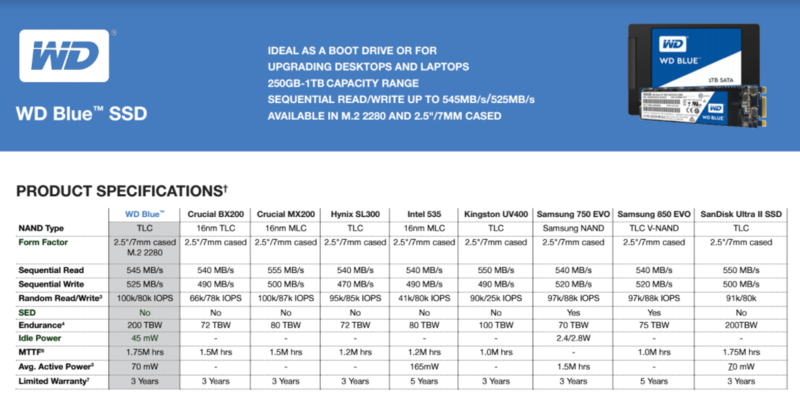 An SSD, the new kid on the market, is kind of a different version of an HDD. Solid-state drives have lesser booting time, draw lesser power, have faster write speed, of other things, and hold a clear advantage over HDDs. A major point of difference is in their functioning – HDDs make use of a spinning disk to hold data, while the SSDs have no mechanical component, whatsoever. This makes SSDs physically more robust and better equipped to take a hit. Remember all the movies where data is erased with a magnet? Well, those were all the weak HDDs. A’int having any of that with the SSDs here! Long story short, I’ve got my hands on a WD Blue 250GB SSD. Spec sheet aside, here is what I think of it, in short. It is blazing fast! It takes no longer than 3 seconds to boot up. I do suppose it is quite common with SSDs, but for a first-timer, wow! The initial installation is pretty smooth. Performace-wise, it is snappy. Doesn’t slow down the system much. Kinda pricey compared to a few others in the same feature ballpark. WD Blue SSD offers the fastest rate of file operations than any other SSD in its price range. That’s about it. SSDs are new to the market but are well on their way to becoming the mainstream storage devices. As such, their only limitations in comparison to the HDDs are that they are expensive, and currently only equipped to store smaller amounts of data. That being said, both the drawbacks will fade over time – and SSDs will prevail! Until then, I reckon the market is big enough for both HDDs and SSDs to co-exist in harmony. So, the next time you’re looking for an internal hard drive and have a bit of extra money to burn, embrace technology and give SSDs a chance! You’d be doing yourself a favor! WD Blue 250 GB SSD is currently priced at Rs.8999/- in Amazon.in, keep an eye open for attractive offers because I’ve recently seen it for a lesser price than that.